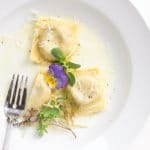 Tender homemade ravioli filled with sautéed mushrooms and onions mixed with creamy goat cheese, ricotta and fresh fragrant rosemary. With a mixer and a dough hook, add the flour and salt add mix for a second. Then add the oil and 1 egg at a time while mixing. Mix until the dough forms a ball. Knead till smooth and then cover and let rest for 30 mins. You can remove from the mixer and kneed with your hands too if you like. Wrap in plastic wrap and store in the fridge until you are ready to make the pasta. Heat a pan to medium heat. Add the butter, shallots, and leek and cook for a min or two. Add all the mushrooms and saute for a couple mins until the mushrooms wilt and start to brown. Remove from heat and let them cool. To a bowl, add the ricotta, goat cheese, and rosemary and mix. Add the mushroom mixture when its cool and season with salt and pepper to taste. Start with 1/4 tsp salt and 1/4 tsp pepper. When you are ready to make the pasta, cut the pasta dough in quarters and cover the rest so it doesn’t dry out. Flour the counter and press the dough flat to put in the pasta machine on the widest setting, do this 2 or 3 times then after turn the dial to the next setting getting thinner as your turn the dial. You want a very thin long sheet of pasta. Lay a sheet down on your ravioli maker and push the pasta down into the holes. The pasta sheet will be longer than the ravioli maker. Let the excess just sit there for a min. Fill the holes of the ravioli maker with filling. About 1-1.5 tablespoons of filling. Fold the pasta sheet back over top of the ravioli. Using your rolling pin, roll over top of the ravioli maker to finish. Pop the ravioli out and continue on until you have used up all the filling or dough. Start a pot of salted water boiling on the stove. Heat a small skillet to med-low and add the butter. When it melts, add the limoncello and stir. Add the half and half cream and stir to combine. Turn the heat down to the lowest setting to keep warm until you are ready to serve. Once your water is boiling, drop in a handfull of ravioli at a time. Let it cook until they float (this will only take a couple mins) and then scoop them out with a strainer spoon. Plate them right away and serve with a couple tablespoons of the sauce drizzled on top, a sprinkle of parmesan cheese and a pinch of salt and pepper. If you use the same ravioli maker as ours, this recipe will make about 6 sheets of 10 ravioli so about 60 ravioli. For nutrition purposes, we estimated that if you serve this as a main course, you would serve 8 ravioli per person and that would feed about 8 people. The dough can be made ahead of time and it can stay in the fridge for about 2 or 3 days before you must use it.